Matt Moss, Styke and Dinsdale race to overall round victories in Victoria. Motul Pirelli Suzuki’s Matt Moss claimed victory in the fourth round of the Monster Energy MX Nationals, his first overall since rejoining the MX1 category in 2013. Moss rode his RM-Z450 to his second straight GoPro Super Pole before winning the opening moto, and clinched the round with second in moto two. The result for Moss narrowed the gap to 27 in arrears of series leader Todd Waters (Motorex KTM), who salvaged fifth for the round despite a concussion suffered in a local Queensland race last weekend. “At the start of the year Jay [Foreman] said to me, let’s just build,” Moss said. “The bike’s great and Jess and I have really gelled. So many people behind the scenes make this possible, so I really need to thank Motul Pirelli Suzuki. Winning the second moto was Scotsman Billy Mackenzie (CDR Yamaha), breaking through for his first win of the year in moto two with a dominant victory. Earlier, the former GP rider rode to third in moto one even though he went down during the moto. Mackenzie’s result boosted him back to third in the series after a disastrous Wonthaggi weekend a fortnight ago, and he’s taken a lot of confidence from the result today. Matt Moss was the overall winner in MX1 at Broadford. Image: Simon Makker/Makkreative.com. “There’s a lot of racing left, I know Todd’s got a big lead, but I feel like I’ve got to grips with the bike and the team’s working really hard,” Mackenzie explained. “Today’s the first day that I actually felt like me, because the first rounds were a real struggle. I feel like I was lucky to even get on the podium at the first two. “I obviously had a bad round at Wonthaggi, but we worked hard this week, we’ve been working hard together and it’s nice to get a win – good to see I’ve still got it and the bike was working fantastic. Claiming his first career podium was MX1 rookie Kirk Gibbs, maintaining Motorex KTM’s perfect podium run. Gibbs was fourth in moto one and sixth in the second, however it was his four points scored for second in Super Pole that placed him on the podium. “I’ve just gotta give it up to my family, they’ve been behind me 100 percent,” Gibbs said. “The Motorex KTM team took a big gamble on me this year, I struggled for the first couple of rounds there, but we’re getting over that and moving forward. Jake Moss (Campbell Mining Suzuki), twin brother of Matt, was fourth overall with a consistent 5-3 effort. Moss was again right on pace, but minor errors during the motos forced him to settle for fourth. 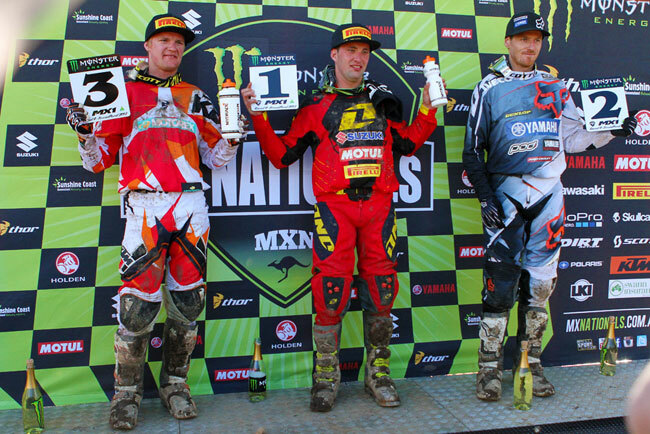 The MX1 podium of Matt Moss, Billy Mackenzie and Kirk Gibbs. Image: Simon Makker/Makkreative.com. Waters was ultra impressive in moto one with a second after being cleared in compete by Suzuki RACESAFE after qualifying. Moto two was tougher, as he circulated to eighth with the goal of maintaining the red plate. “I come here to do one thing and that was to keep the red plate,” Waters said. “That last moto was one of the toughest I’ve ever ridden but I have to hand it to the guys on the podium – they rode the wheels off their bikes. Monster Energy Kawasaki’s Adam Monea again featured at the front throughout the motos, winding up with 7-4 finishes in his maiden MX1 campaign to score sixth overall. Berry Sweet/Lucas Oil Yamaha rider Tye Simmonds had his strongest performance of the season in seventh. He was eighth in moto one, but it was his impressive moto two ride to fifth that turned heads. CDR Yamaha’s Lawson Bopping finished eighth for the round with a 6-8 scorecard, while Daniel McCoy (9-11, Carlton Dry Honda) and Cody Cooper (14-9, Motul Pirelli Suzuki) completed the top 10. Four-time champion Jay Marmont (Monster Energy Kawasaki) experienced another difficult day with 11th, just ahead of Sam Martin (DPH Motorsport Suzuki) and Cody Mackie (Zero Seven Motorsports Kawasaki), who returned from injury for the round. The top 15 overall was completed by privateer standouts James Booth-Elliott (Suzuki) and Daniel Banks (KTM). 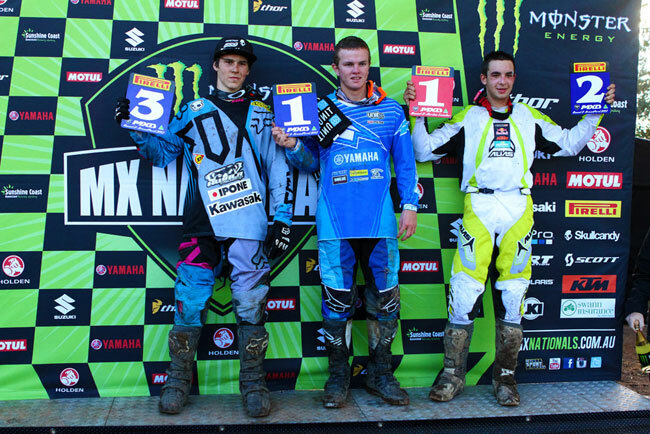 Luke Styke extended his MX2 series lead with his third win of the season. Image: Simon Makker/Makkreative.com. 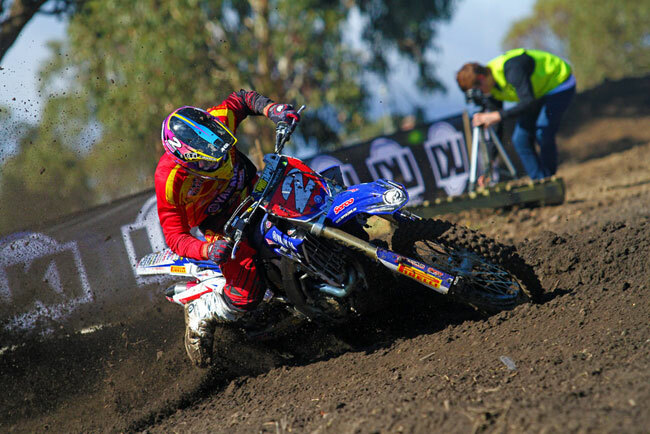 Serco Yamaha’s Luke Styke extended his MX2 championship lead to 30 points, winning his third overall round of the season with a 2-1 performance. Styke stalled in moto one after leading early, but rebounded for an authoritive moto two win. He was happy to chalk more points on the board as the season approaches halfway. Styke tied on points with Josh Cachia (Carlton Dry Honda), who went 1-2 for the weekend. Cachia recovered from a bad start in moto two, continuing his recent run of form and he’s now climbed to fourth in the standings. Another consistent effort from rookie wonder Luke Clout landed him third overall on the second of the Serco Yamahas, posting 6-3 moto results. He’s still second in the standings and will gain strength as the season progresses. “It was a pretty good round for me, I struggled in the first race we had a bit of a front wheel problem, but I knew I had to get a good start in the second,” Clout commented. Queensland KTM privateer Brock Winston was a determined fourth after charging to 4-5 finishes on his 250 SX two-stroke despite a fall on the final lap of the first moto. 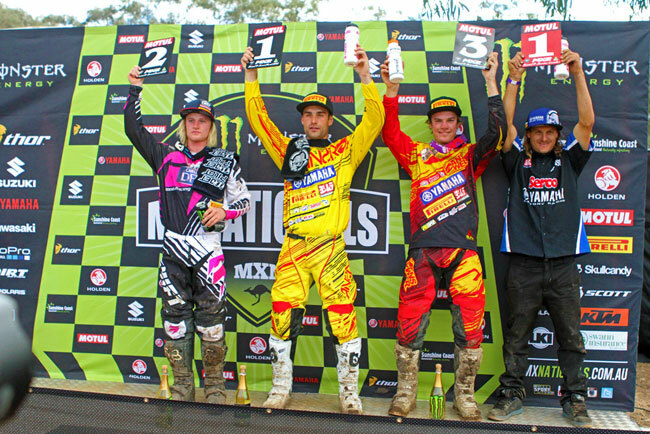 Styke, Josh Cachia and Luke Clout made up the MX2 overall podium. Image: Simon Makker/Makkreative.com. Raceline Pirelli Suzuki’s Ryan Marmont was a season-best fifth with a third in moto one, fending off an inspired late challenge from Winston. He cemented his top five with seventh in moto two. Rounding out the top 10 for the weekend was last year’s MXD champion Kayne Lamont (10-4, Choice Motorsports KTM), fellow Kiwi Rhys Carter (5-9, Suzuki), returnee Dylan Peterson (11-6, Zero Seven Motorsports Kawasaki), Kieran Scheele (8-10, Honda) and Takeshi Katsuya (7-12, Full Force Racing Honda). Highly-touted Queenslander Joel Dinsdale (GYTR Yamaha) picked up his first MXD overall in his young career, sweeping the round and making it three race wins in succession. Dinsdale was superb out front as he proved the class of the field all day long, now ranked fourth in the standings – 25 points off new leader Hamish Harwood (KTM). Kiwi talent Harwood was ever-consistent to score second overall with 2-2, granted the series lead after rounds one and two winner Jack Simpson (KTM) crashed out of moto one. Simpson injured his finger in that fall, returned to the pits, then back to the track, but was ruled out of the race by series officials. 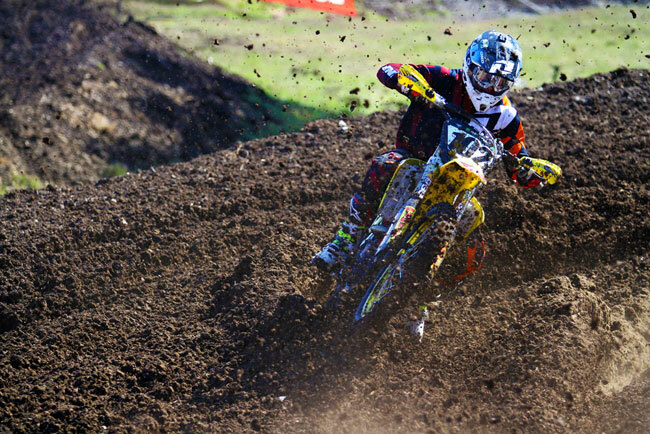 He was third in moto two, placing him 12th overall for the round and third in the series, 22 points behind Harwood. Kawasaki rising star Jesse Dobson completed the podium for the weekend with 3-5 and slotted himself in second for the season, just two points ahead of Simpson. Corey James (Yamaha) was a fine fourth for the weekend with sixth in moto one and fourth in the second, edging out Tomas Ravenhorst’s (KTM) 5-7 results. The MXD podium of Joel Dinsdale, Hamish Harwood and Jesse Dobson. Image: Simon Makker/Makkreative.com. The Monster Energy MX Nationals series will resume at Conondale on Queensland’s Sunshine Coast on Sunday, 2 June. MX2: Moto1 :Top 10 is Cachia, Styke, Marmont, Winston, Carter, Clout, Katsuya, Scheele, Stapleton and Lamont, Peterson . MX2 : Moto2: Top 10 is Styke, Cachia, Clout, Lamont, Winston, Peterson, Marmont, Ryan, Carter and Scheele. MX 1: Moto 1: Matt Moss wins moto one from Waters, Mackenzie, Gibbs, J Moss, Bopping, Monea, Simmonds, McCoy, Wright, Martin, Norris, Mackie, Marmont and Cooper (provisional). MX 1: Moto 2: Top 10 is Mackenzie, M Moss, J Moss, Monea, Simmonds, Gibbs, Bopping, Waters, Cooper, Marmont, McCoy, Martin and Booth-Elliott. MXD: Moto 1: Dinsdale wins comfortably from Harwood, Dobson, Scott, Ravenhorst, James, Wilson, Court, Wightman and Evans. MXD: Moto 2: Dinsdale wins moto two and the overall from Harwood, Simpson, James, Dobson, Wightman, Ravenhorst, Blackburn, Evans and Scott.